I’ve been fighting bronchitis and a killer cough over the past week, and until a friend of mine at work suggested these delicious wonders, I had been sprayinig my throat with nasty Chloroseptic. 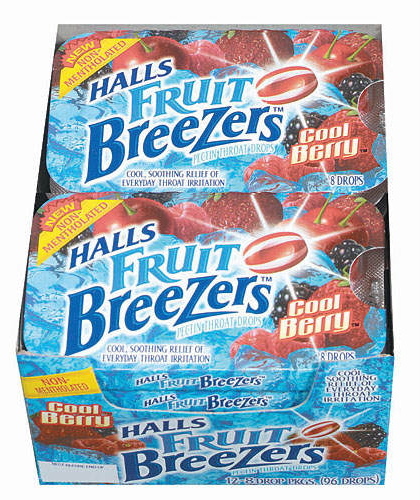 Halls Breezers are precisely what you want as a sick person: good medicine that doesn’t taste like medicine. In fact, Breezers taste more like a candy version of those orange vanilla popsicles I used to love as a kid. Or at least the flavor I had did. There are several kinds, Cool Berry and Cool Citrus Blend and Cool Creamy Strawberry (all cool, I guess). I can’t recommend these enough. They’re a safe bet even if you aren’t sick. Think of it as candy that’s good for you.